What Do I Need In My Home Theater To Watch 3D? Although manufacturing of 3D TVs has been discontinued, there is still a loyal group of fans out there viewing 3D on TVs and video projectors that may be still available or in use. Also, there is still 3D content out there to watch if you know where to find it. If you dare to take the plunge, find out what you need to get that immersive 3D viewing experience. As your starting point, you need a TV or video projector that meets approved 3D specifications. This includes some LED/LCD, OLED, Plasma (Plasma TVs were discontinued in late 2014, early 2015, but there are many still in use), as well as DLP and LCD-type video projectors. 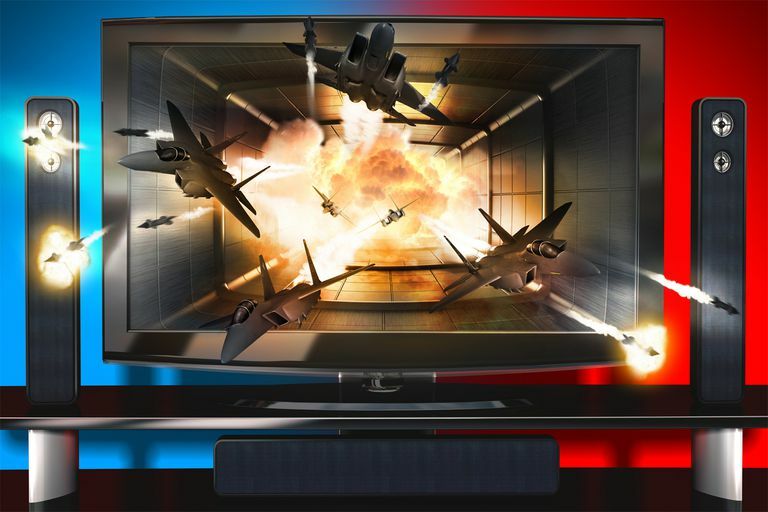 All 3D-enabled TVs and most 3D-enabled Video Projectors work with the 3D standards approved for Blu-ray, cable/satellite, and streaming sources. Also, all consumer-based 3D-enabled TVs and video projectors display standard 2D as well, so you can enjoy all your TV programs, Blu-ray Discs, DVDs, and other video content just as you always have, in the way you are used to seeing it. Once you get your 3D TV or video projector, you need to make sure it is set up for the best possible viewing result. In order to watch 3D Blu-ray Discs, you need a 3D-enabled Blu-ray or Ultra HD Blu-ray Disc player. However, in addition to playing 3D Blu-ray discs, all of these players will still be able to play current Blu-ray Discs, DVDs, and CDs. There are well over 500 3D Blu-ray Disc titles available in the U.S. and more internationally, and although you can't always find them at your local retailer, many titles, including a steady stream of current releases can be ordered online. For the most comprehensive selection, check out the listings at Amazon.com. To receive 3D content via HD-cable or Satellite, you may need a 3D-enabled cable or satellite box and a subscription that includes access to any 3D channels or services. Some cable providers offer 3D content via Video-on-Demand services. To find out if your cable services offer 3D content, contact them directly. Of the two major satellite providers, Dish offers 3D programming on two of its channels, for more details on what box is required, titles, and pricing, refer to the Dish 3D Programming Page. DirecTV discontinued their 3D programming services. If you have 3D TV and receive some or most of your programming via internet streaming, there are three main options for accessing 3D content. Vudu: Vudu offers a 3D channel viewing option that features select movie trailers, shorts, and feature films that are available on either a pay-per-view or purchase basis. Check out their periodically updated listing. 3D Crave: 3D movies and other content available on a Video on Demand basis. Includes feature films, TVs, and photography. Some content is free and some are offered on a 48-hour rental basis with prices starting at $1.99. Available on Roku and Fire TV. YouTube: There is a lot of user-generated 3D content available on YouTube. However, some of it is based on the Anaglyph system, which can be displayed on any TV or computer monitor, but requires passive glasses with red and green or red and blue filters. The quality is poor when compared to the passive an active 3D systems used by TVs and video projectors adhering to official 3D standards. Check out more options, including renting 3D Blu-ray Discs. Yes, you will need to wear glasses to watch 3D. However, these are not the cheap paper 3D glasses of yesteryear. The glasses that will be used will most likely be one of two types: Passive or Active. Passive Polarized glasses look and wear much like sunglasses and have enough front space to place over existing eyeglasses for those that need to. These type of glasses are inexpensive to manufacture and would probably cost consumers $5 to $25 for each pair depending on the frame style (rigid vs flexible, plastic vs metal). Active Shutter glasses are slightly bulky since they have batteries and a transmitter that synchs the rapidly moving shutters for each eye with the onscreen display rate. These type of glasses are also more expensive than passive polarized glasses, ranging in price from $50 to $150 depending on the manufacturer. The brand and model TV or video projector you have determines which type of glasses (passive polarized or active shutter) you will be required for use. For example, LG 3D-enabled TVs require passive glasses, while some Sony TVs required active shutter glasses, and some require passive. All consumer-based video projectors (either LCD or DLP) require the use of active shutter glasses. You may get one or two pairs of glasses with the set or projector you purchase, but most likely it will be an accessory that must be purchased separately. Prices for the glasses will vary, at both the manufacturer's discretion and what type they are. As mentioned above, active shutter glasses will be more expensive than passive polarized glasses. Another factor to take into consideration is that glasses branded for one manufacturer may not work another's 3D-TV or video projector. In other words, if you have a Samsung 3D-TV, your Samsung 3D glasses will not work with Panasonic's 3D-TVs. So, if you and your neighbors have different brand 3D-TVs, you will, in most cases, not be able to borrow each other's 3D glasses. However, there are several companies that make 3D glasses that can be used on several brands of TVs and video projectors. One example is XpanD, a third party company that makes 3D glasses for both commercial and consumer applications, offers 3D Glasses that can work on many available 3D TVs and projectors that use the Active Shutter system. Although the addition of 3D does not change anything with regards to audio, it may affect how you connect your 3D TV with the rest of your home theater system. For example, if you normally send both your audio and video signals through a home theater receiver, on the way to your TV, then your home theater receiver also needs to be 3D-compatible. However, there are some workarounds if your home theater receiver is not 3D compatible. Although Glasses-Free 3D is being used in commercial, medical, and scientific applications, and is available in small form factors for consumers in a limited number of tablets, smartphones, and portable game systems, progress towards affordable implementation for mainstream consumers has been slow, confined mostly to demonstrations of pre-production prototypes at trade shows, such as CES. Although some 4K Ultra HD TVs offer (or have offered) a 3D viewing option, the 4K Ultra HD standard does not include a 3D viewing standard. What this means that most 3D content is provided in either 1080p or 720p resolutions, and a 3D-enabled 4K Ultra HD TV will upscale the 3D signal to 4K for screen display. There is no indication that the 4K Ultra HD standard will ever include a 3D viewing format, with manufacturers opting instead on other picture enhancements such as HDR and wide color gamut. However, if you are a 3D fan, take heart, 4K upscaling (such as LG's Cinema 3D+), in combination with optimizing your picture settings, can deliver a great 3D on a 3D-enabled 4K Ultra HD TV. If you are bummed about the demise of 3D TV, two alternatives that can provide the best possible 2D movie viewing experience are 4K Ultra HD TVs with HDR and 4K Video Projectors. However, just as with 3D, you need more than just the TV or video projector.